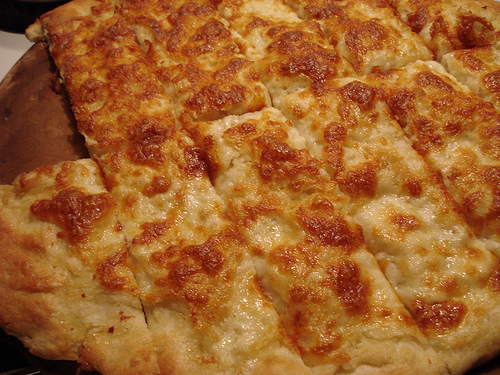 Last night my husband and I enjoyed some delicious (if I do say so myself) garlic fingers. I happened to mention this on a social media site and it was requested that I share the recipe with you. So here, my friends, is our recipe for garlic fingers and donair sauce. If you aren't from Atlantic Canada or the mid east you may ask what donair sauce is. It's a sweet, tangy sauce that is found on donairs and is used to dip garlic fingers or pizza in to. When we lived out west at the beginning of our marriage, we were served spaghetti sauce with our garlic fingers (not my number one option), no one there knew what donairs were at the time. I guess there weren't enough Maritimers there yet. We quickly called a friend back east to find out how his family made the sauce. This is a very "to taste" recipe. My apologies. Place all ingredients in breadmaker on dough setting and press start. When dough has finished cycle, remove to a floured surface and roll out to pan specifications. Mix 1/8 cup softened butter (you may need more, I never measure) with as much garlic as you like. Can be fresh, roasted or powder format. I can't give an exact amount here because I like a lot of garlic. Spread out on dough. Grate as much mozzarella cheese as you desire and spread out on the dough. Dice up some cooked bacon (you could use bacon bits, but I like the taste of this better) and sprinkle out on the dough. Cook in a preheated oven of 400 F for 10 mins or until cheese is golden. Cool a bit. Cut in half and then in the opposite direction every one inch or so. Mix 1/3 can of sweetened condensed milk with 3 tbsp vinegar (this is really to taste, you want it to have a tang to it) add desired amount of garlic. Mix well. Dip garlic fingers in sauce and enjoy! Remember, if you don't have your own bowl of sauce, don't double dip! This looks SOOOO good!! Thank you for sharing your donair sauce recipe. I've never seen a recipe with condensed milk, I always used evaporated. mmmmmmmmmmmsounds so delicious! I love garlic bread but have never put bacon on it......yet, that is! I like the evaporated milk recipe better. Mix well, than add 2 or 3 tbsp of vinegar and it will thicken up, but don't stir it too much or it will thin out again. Refrigerate for a bit too. Thanks for sharing Liz!! We made it on Friday and it was super yummy! Everyone liked it!! I hope you don't mind that I included at link back to your site on my site under weekly menu plan for this recipe. This will definitely be a regular in our house, I don't think I will ever buy pizza/ garlic fingers again. Thanks for sharing this recipe. It was great!